Today we are welcomed into the Victorian home of Terese Eriksson. Terese is the person behind cupcake business Betty-Lou’s Bakery, which you might recognize from some of London’s vintage markets. 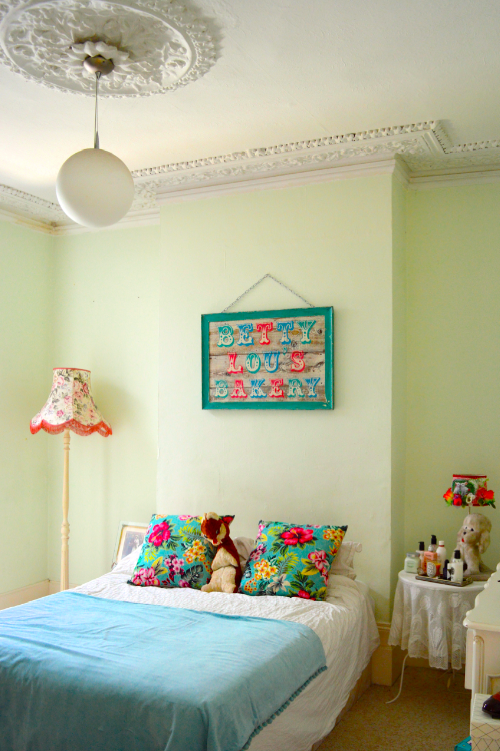 When not busy baking cupcakes, Terese is decorating her home into a colourful mix of retro chic and eclectic Victorian style. 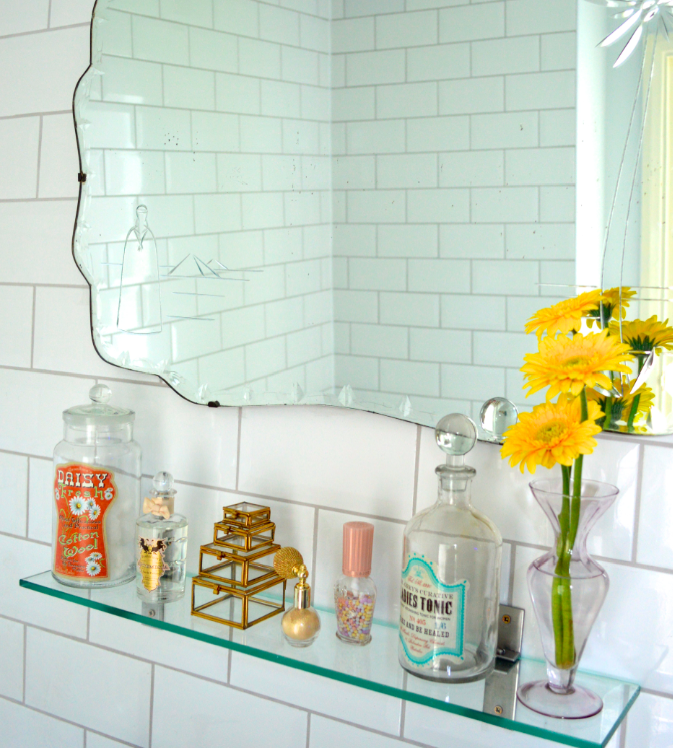 I used to be into a more minimalist Scandinavian mid-century style before I moved to England. 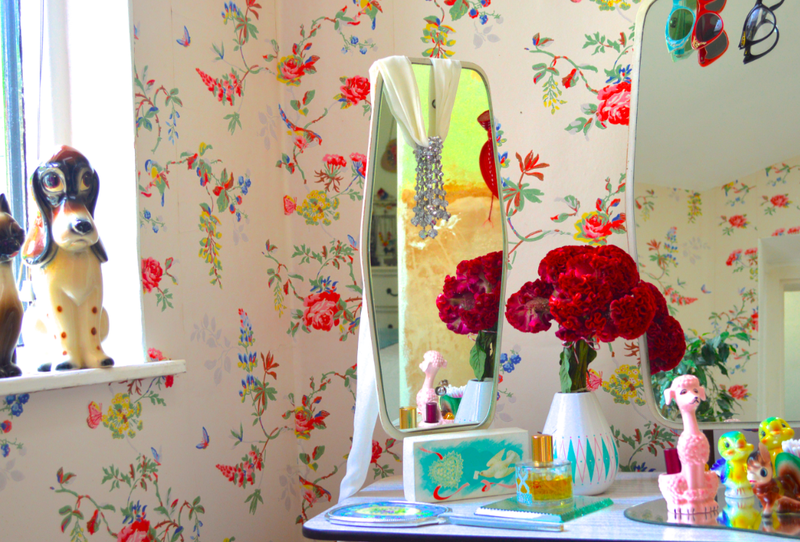 When I came here nine years ago I discovered Cath Kidston, and now I just love the English vintage style. My inspiration ranges from the Victorian era into the 1950s. One of the things that appeals to me with the Victorian era is their fascination for death and ghosts. 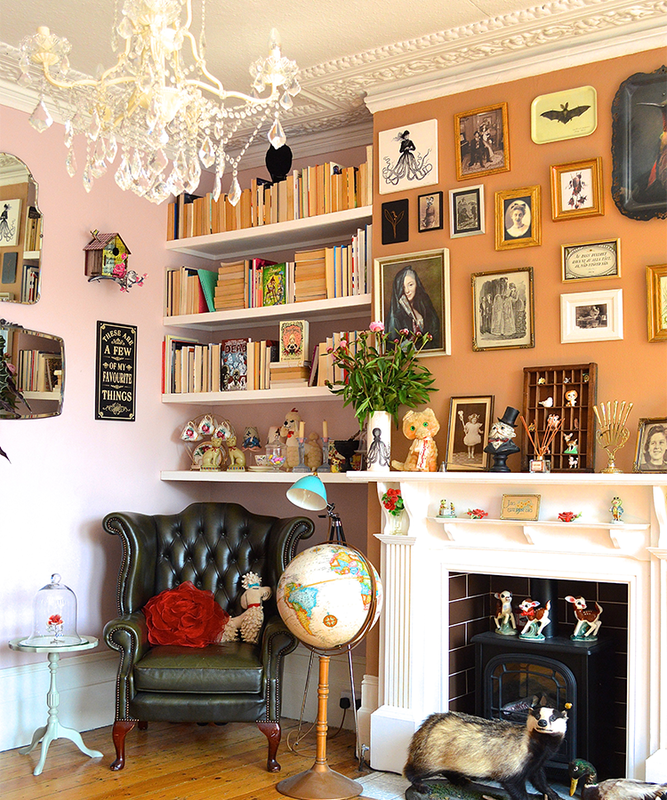 My style may look very bright, but if you look more careful to my picture wall above the fireplace, for example, you'll notice it's actually my own Victorian horror wall! 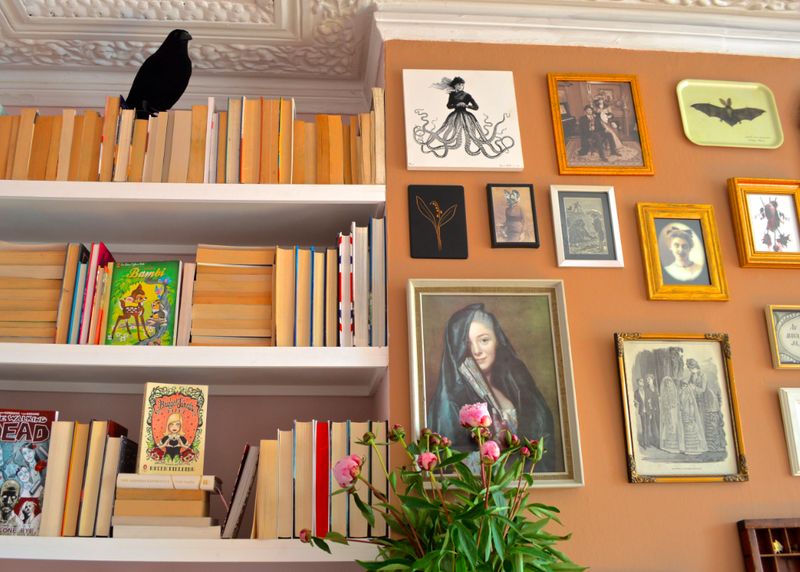 What I also like is the Victorian incorporation of nature into furniture, like the spider webs in the shelf brackets I have in my kitchen. 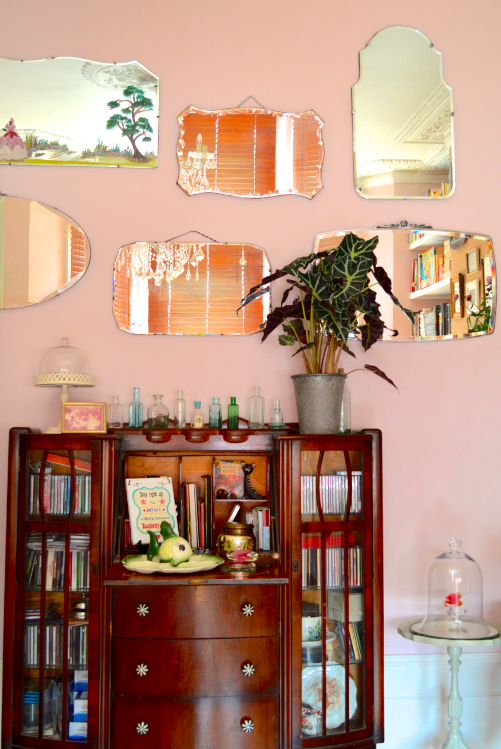 The walls in the living room are painted soft pink and the small lamp is an Italian charity find. 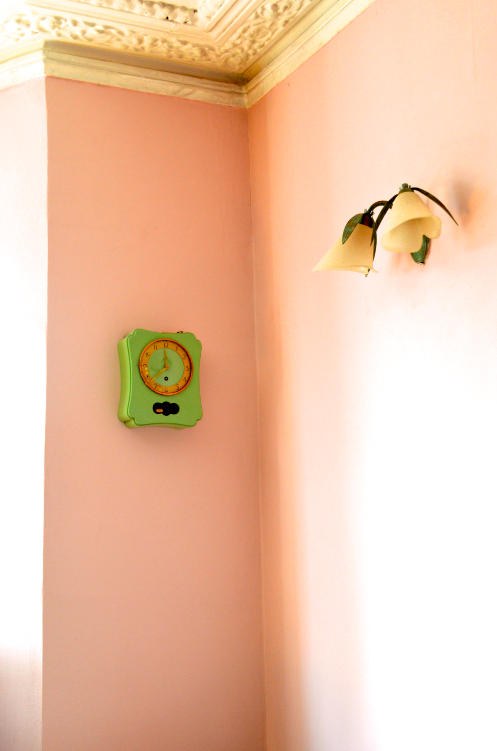 The adorable little green clock used to be in a Swedish museum for over 60 years before I bought it. It is from the 1940s and works perfectly. 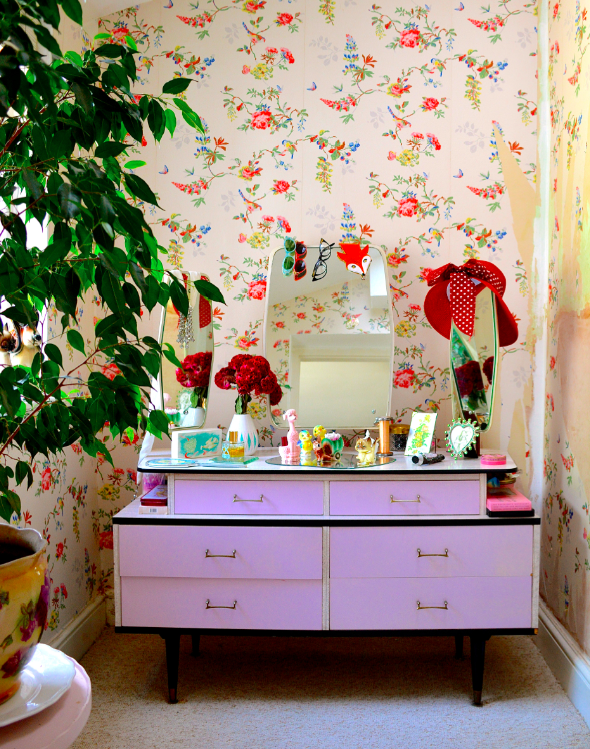 You have a long experience of searching through vintage markets and charity shops. What's your best find? 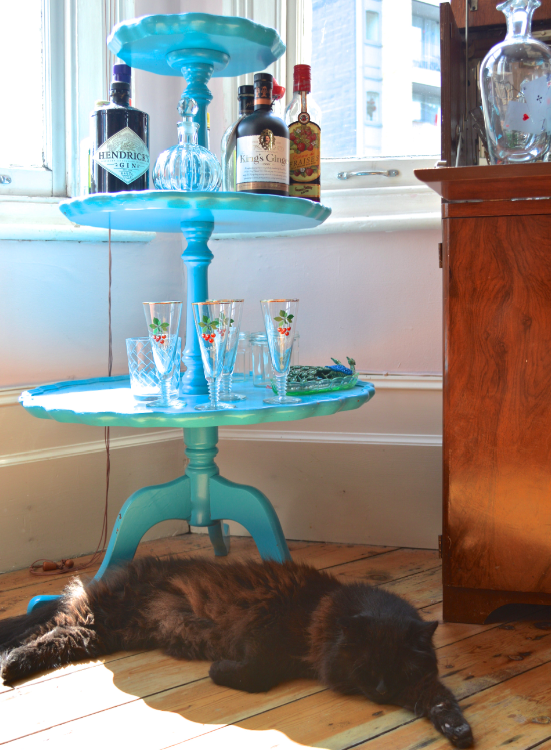 I love the blue butlers table under the window that looks like a giant cake tray. It was a bargain and I later found out it is Victorian and probably worth tens of times more than I paid for it – had it not been painted. I also did a real good find when I bought the drinking cabinet and matching writing cabinet in the living room. I bought them from an old cockney man that normally sells wood and coal. They are mid-century and the drinking cabinet still has the original juice press and cocktail stirrers in it. I buy a lot of interior magazines, but I also find plenty of inspiration from period movies. Our next project is to redecorate our bedroom inspired by the movie Cabaret. It will be in a 1920-30s style with darker colours, wood and a large rattan bed frame. I also get a lot of inspiration from what I see at different vintage markets that I go to with Betty-Lou's Bakery. Since I am there before it opens in the morning I always get first dibs! 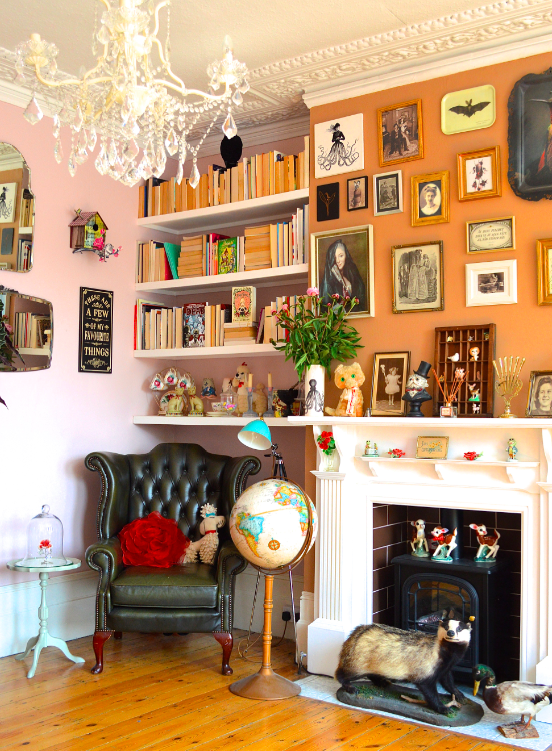 What's your favourite place in your home? 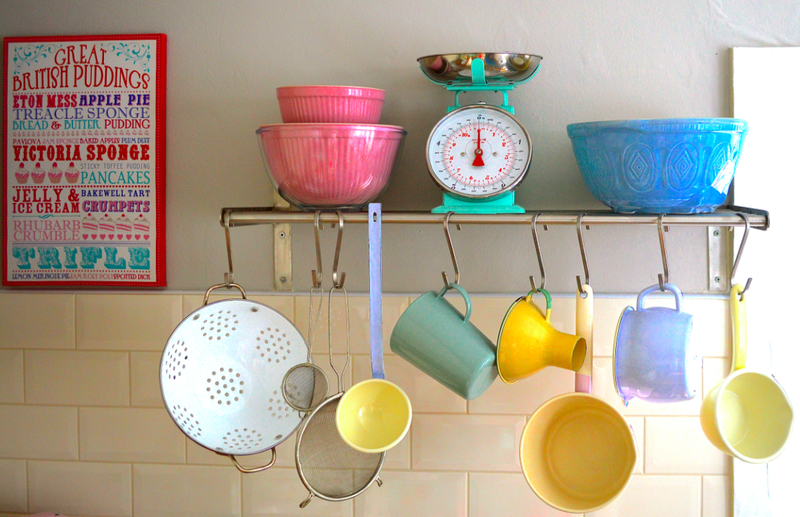 I love my kitchen and I couldn't live without it. 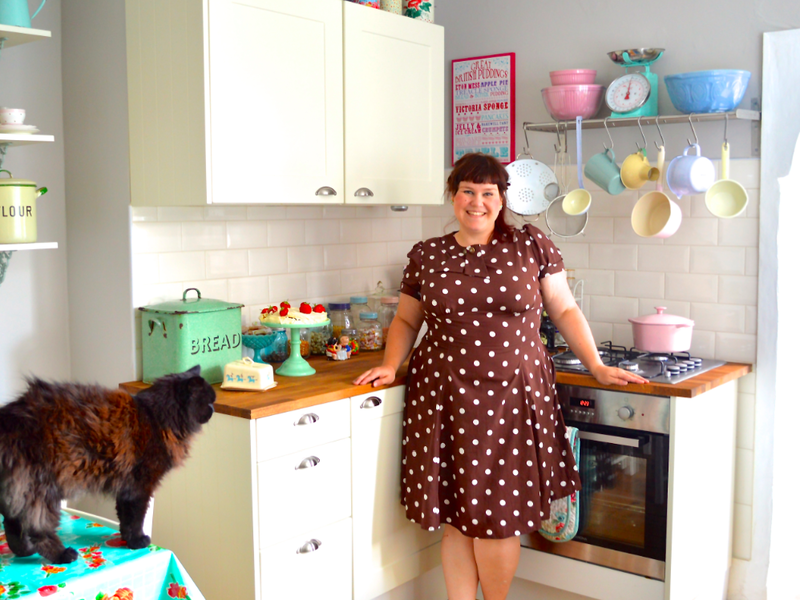 It is also the place where I bake all my cupcakes for Betty-Lou's Bakery. When I have a baking day I just remove everything from the kitchen and then I bake like crazy. Sometimes up to 300 cupcakes in one go! 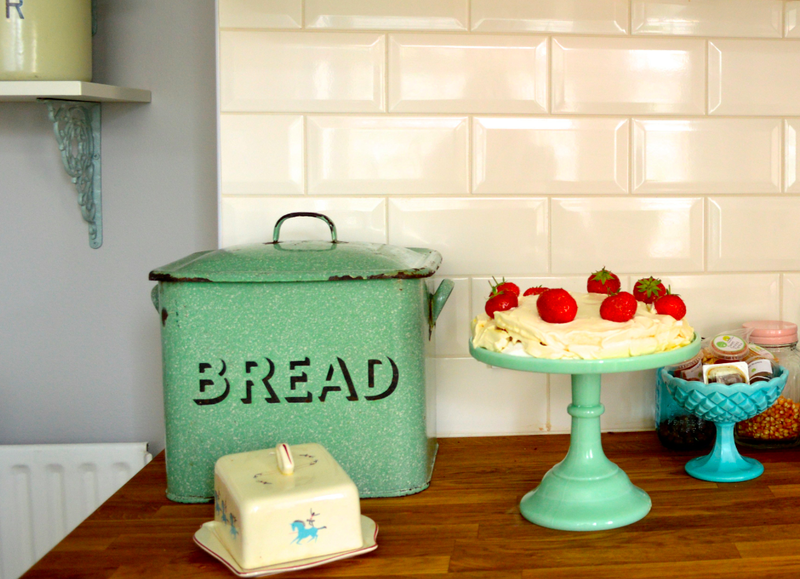 We just redid the kitchen and we went for a little more industrial style than the rest of the house, with some French influences, like plenty of enamel and the tiles which are French and the same type they use in the Métro in Paris. 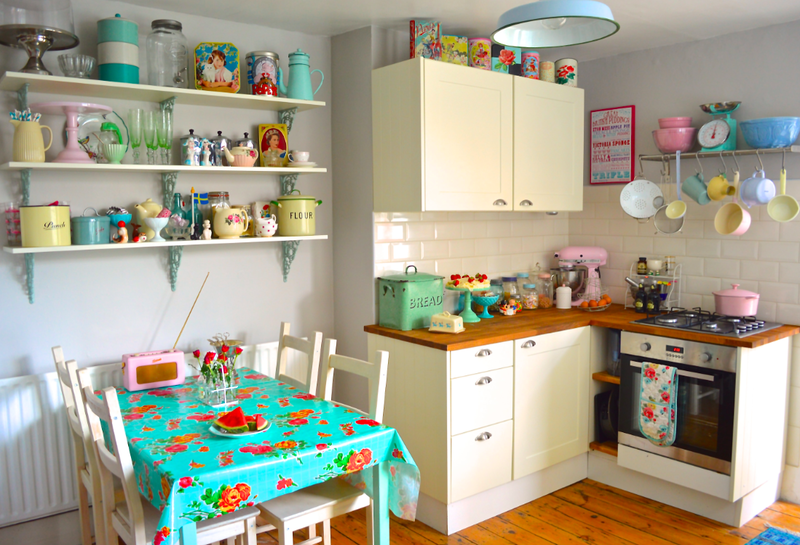 My dream buy would be an American retro fridge in pink or turquoise to complete the kitchen look.